The PCR-M1 is the most compact, powerful USB MIDI keyboard controller available! This incredibly slim device is based on the highly-popular PCR-1, but lacks the audio I/O of the PCR-1 and adds a number of new MIDI features to make it more analogous to the larger PCR-series MIDI controllers. 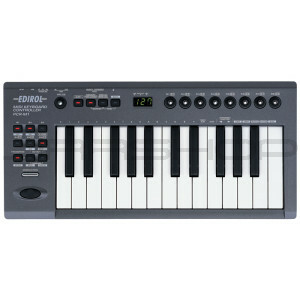 Like the PCR-30/50/80, the PCR-M1 includes a 1x1 MIDI interface, sustain-pedal connection, and expression pedal connection. Unlike any other PCR-series controller, the PCR-M1 offers a rotary encoder that can be assigned to a number controls including scrolling control maps, adjusting velocity, changing MIDI channels, and more. The PCR-M1 also includes three different options for drawing power: 1) USB-powered, 2) AC adapter (optional), and 3) powered by four AAA batteries. Also like its larger brothers, the PCR-M1 offers V-LINK support for control of video devices directly from your keyboard. The PCR-M1 is incredibly versatile in terms of control. It offers 27 different parameter controls available from 16 different physical controls, and functions with the powerful PCR-Editor available for PC & Mac. The PCR-M1 uses Edirol & Roland’s S.L.I.M. technology, providing a remarkably playable action with a very short throw and very little side-to-side play in the keys. It may be small, but this feature-packed device is no toy! The PCR-M1 measures a mere 1-3/16" thick and weighs just 2lbs. 11oz. It comes with a protective neoprene sleeve to protect it in travel.